U.S., Caribbean Ministers Meet To Confront Disaster Resilience – And China's Influence? 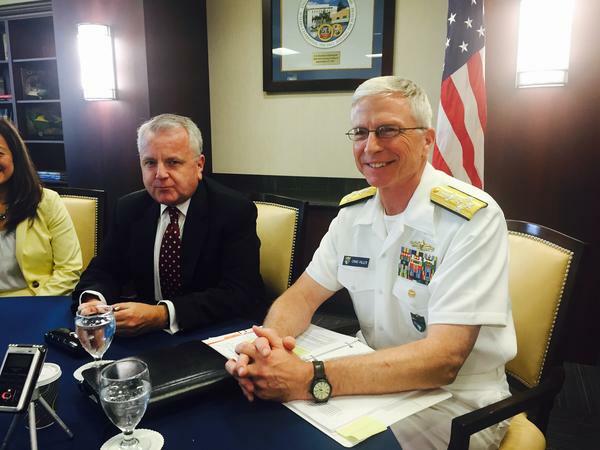 U.S. Deputy Secretary of State John Sullivan (left) and Southcom commander Admiral Craig Faller after their conference with Caribbean ministers in Doral last Friday. President Donald Trump recently met with five Caribbean heads of state at his Mar-a-Lago resort in South Florida to discuss how the U.S. can help that region. U.S. officials followed that by meeting with ministers from almost 20 Caribbean countries in Doral. Trump last month wanted to thank Caribbean leaders for backing his campaign to put pressure on Venezuela’s authoritarian regime. They in turn wanted to know how the U.S. can help them make up for the cheap Venezuelan oil they’re losing – as well as help them build more hurricane-resilient islands. Ministers from 18 Caribbean countries met at U.S. Southern Command, or Southcom, in Doral last Friday with Deputy Secretary of State John Sullivan to address at least the latter concern. “Talking just now about disaster preparedness and resilience – on that topic this is about as big and inclusive and integrated a meeting as I’ve been involved in with our Caribbean partners and allies,” Sullivan said alongside Navy Admiral and Southcom commander Craig Faller after a U.S.-Caribbean Resilience Partnership was signed in areas such as space technologies and infrastructure building codes. The meeting took place, however, amid growing concern in Washington that China is significantly challenging U.S. influence in the Caribbean. Beijing’s global Belt and Road project is also aiding Caribbean countries with infrastructure improvement. That includes a recent $600 million loan to the Dominican Republic to strengthen its power grid. But Sullivan insisted that’s not the U.S.’s motivation. Still, Florida Senator Marco Rubio recently said he was “very concerned” about the geopolitical inroads China is making in the U.S.’s neighborhood.